Table saws are typically the central piece of machinery in most wood shops and usually the first purchase for most woodworkers when they are assemblying the woodworking equipment they're going to need. There are three main categories of table saws on the market and they are bench, contractor's and cabinet models. Hybrid table saws are a more recent category with features that fall somewhere between a contractor's and a cabinet saw. There are also differences in the mobility of table saws, features, and performance. Portable Table Saws have some distinct advantages over larger stationary table saws. They are lighter, often made of plastic and aluminum. Because of this, they are easy to transport from job to job and they usually have a built in stand or are a bench type model that is made to sit on a bench or saw stand. Portable table saws perform most all of the same long straight rip cuts (with the grain) and crosscuts (across the grain) more quickly and accurately than a hand held circular saw. Their lightweight and ease of mobility make it the perfect choice for on site work like decks and framing jobs. Floor standing or stationary table saws are heavier, usually made of steel or cast iron to provide weight and reduce vibration. They are found in all sizes of woodworking shops and are a permanent fixture. They usually have larger more powerful motors that enable the saw to perform operations beyond ripping and cross cutting such as dadoing and running molding heads. They are designed to mill wood, to make heavier cuts and remove large amounts of stock. The types of stationary saws differ in size, price, and performance. A contractors table saw is usually a 10" bench model format mounted on a separate open steel stand. Motors are usually belt driven and hang off the back of the saw. The horsepower on these saws is usually between 1 1/2 to 3 HP. Contractors table saws are typically wired for 110v household current, although some heavier motors are wired for 220v. The trunnion on the contractors saw is usually mounted to the underneath side of the table top. 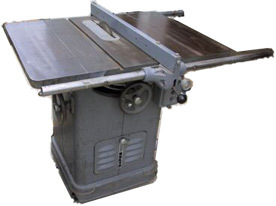 A cabinet saw is typically a floor standing table saw with a full length enclosed steel stand. The Delta Unisaw and the Powermatic Model 66 table saws set the standard for cabinet saws. These are usually at least a 10" diameter saw blade and some go up to 12-14" or even 16" for large commercial cabinet saws. The motors begin at 3 HP but 5 to 7 HP motors are not uncommon. The voltage on these machines is usually 220v. for a single phase motor. Larger motors are quite often 220v or 440v three phase. Cabinet saws are usually much heavier than the lighter contractors saws and are not made to be moved around, although some work well on movable stands. Another significant difference between the cabinet and the contractors saws is that the trunnion on cabinet saws is mounted to the top of the floor standing cabinet, not under the table top like the contractors saw. The hybrid table saw is usually is a mix of features found in the contractors and the cabinet saws. The most distinguishing feature is that hybrid saws use the same trunnion design as the contractors table saw. They are commonly referred to as a light duty cabinet saw but they are usually lighter, have smaller motors, and are priced less than cabinet saws. Table saws also come in three types of power trains. That is the system used to transfer power from the motor to the table saw blade. Direct-Drive Motors are linked directly to the blade and transfer all of the motor’s power to the blade. Most portable saws have direct-drive motors. Belt-Drive Motors have a belt that transfers power from the motor to the blade. The table saw motor is usually mounted below the saw carriage or at the back of the saw cabinet and the power from the motor is transferred to the saw blade using one or more belts. The advantage of belt-driven saws is that the motor is usually away from the source of most of the sawdust. Flex-drive motors are not as common as the other two. Sears Craftsman made a line of flex-drive motors that used a flexible steel shaft to transfer power from the motor that hung off the back of the saw and the blade arbor. These eliminated some of the vibration found in belt-driven models. Newer belt designs, however, have eliminated most of the belt vibration. A good quality saw will not vibrate. In fact there is a vibration test called the nickel test that serious woodworkers like to run on their table saws (stand a nickel on edge when starting the saw and see if it stays standing). A saw that vibrates will be noisy and will give a rough cut. Look for one that passes the nickel test and runs smooth and quiet. Better saws have large miter slots cut parallel to the saw blade. The best of these are T-slots which when used with T-slot miter gauges prevent the gauge from easily falling off the front of the table when cutting large pieces. Miter slots must be parallel to the saw blade. if yours are not, your table top or the trunnion will need adjusting. See the related pages below for more details about miter gauges. A good rip fence is one of the most important features to consider. A good one is straight, easily adjusted and securely locks in position. It must be square to the table and parallel to the saw blade. There should be little to no deflection of the fence when pushing a board against it at the back of the saw. See the related pages below. One would think that all table saw tops are flat. Unfortunately that is not always the case. Use a straight edge to be certain there are no dips or valleys in your saw top. The trunnion holds the saw arbor and allows it to be raised and lowered and tilted from zero to forty-five degrees. Some trunnions are cabinet mounted and others are mounted to the underneath side of the saw table. The table tops on saws with cabinet mounted trunnions are easier to adjust if the miter grooves are not parallel to the blade. They are also easier to get to by removing the table top. Look for solid beefy trunnions. This is where all of the wear and tear take place on the table saw. Large heavy duty trunnions will last for years. The best saws have cast iron, steel or solid aluminum allow extension wings. Letter models have stamped sheet metal extension wings. Extension wings must also be flat and installed so they are perfectly flush with the top of the saw table. Most table saws come from the factory with the following features. Many older saws didn't come with switches and those that did were not always in a convenient location that could be easily accessed in an emergency. Switches on today's saws should be mounted on the front of the saw in a location that is easy to hit or knee to the off position to shut down the saw. Some saws have a plastic safety key that prevents the saw from being turned on accidentally. Most saws come with a general purpose saw blade. Inexpensive saws usually come with steel saw blades. On more expensive saws, they are carbide tipped blades. Other specialty blades are available such as fine tooth plywood blades, and thin-kerf carbide blades that are used when cutting expensive exotic woods to preserve the amount of usable stock. The larger the saw table the easier it is to manipulate sheets of plywood or long boards. The larger work-support surface is always better. Most stationary saws have an optional side extension available on the right side that with longer rip fence rails, can increase the saw's capacity to reach the center of a 4 x 8 sheet or more. These right side extension tables often double as router tables where you can take advantage of the rip fence for straight line cuts. The throat plate is usually a piece of soft metal that fits in the table top around the blade. It must be level with the table surface — in some cases it needs to be shimmed — and fit closely around the blade or else small pieces will drop through. A sturdy quality rip fence is one of the most used and important features on the table saw for turning out accurate work. Of all the features, the Rip Fence is the most important one. It provides a straight edge parallel to the blade and controls the width of the rip. It must lock parallel to the saw blade at every setting. Look for a fence that locks onto and support bars or rails at both the front and back of the saw. The miter gauge is a removable guide for square and mitered crosscuts. Must fit snugly and move freely in the saw's table slots. Look for one that can be calibrated and has positive stops at 45 and 90 degrees. Miter gauges are make in several materials including plastic, aluminum and steel. The blade guard protects the user from the spinning blade, and should never be removed. They come in a variety of styles, some all metal and others made of clear plexiglas to enhance visibility while cutting. Look for one that rises up parallel to the table so it stays on top of the work piece. The splitter is a vertical metal piece directly behind the blade that keeps the blade from binding in the work piece if the saw kerf starts to close up. Newer saws are provided with a thicker and heavier splitter called a riving knife. It is the main safety device to keep wood from kicking back toward the operator. It should mount on the motor assembly so it rises and falls along with the saw blade. Some splitters also adjust to match the width of the kerf. Riving knives are a safety requirement on newly designed table saws as of 2008. The riving knife typically sits closer to the saw blade than the older splitter devices. This positioning provides greater protection. The riving knife is also separate from the blade guard meaning that it can remain on the saw even when the guard has been removed. Anti-kickback paws are usually two sharp-toothed arms one on each side of the splitter that prevent the work piece from moving backward. The elevation wheel is located at the front of the table saw and controls blade height and depth of cut. On a 10-inch saw, the blade should be about 3 5/8 inches high when fully raised so that you can cut through a dressed 4 x 4 in one pass. The blade tilt hand wheel is located on the right or left side of the saw depending on which direction the arbor tilts. It adjusts the angles of the blade for bevel cuts up to 45 degrees left (away from the rip fence). Extension wings come in a variety of styles and extend the width and sometimes the depth of the table saw table to provide a larger more stable work surface when cutting stock. Heavier saws come with sold cast iron extension wings while others may be a webbed cast iron or solid or webbed aluminum. Outfeed extensions provide more table surface when cutting long stock.